Unic supply solvent and waste management products including an award winning spray gun cleaning system. Licensing and ever-increasing waste disposal costs have seen an upturn in the use of solvent recyclers therefore Unic International have created the finest ‘KOMBI’ system for the cleaning of Spray Guns and recycling used solvent. A larger than normal washing tank giving a 50 second automatic wash as well as manual washing and manual rinsing. 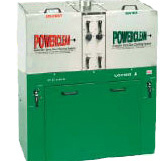 A full 25lt capacity recycler ensures the Spray Gun cleaning solvent is always kept clean. The Spray Gun cleaning pump has a 5-year warranty ensuring a cost and trouble free life.